If your Apple iPhone, iPad and iPod Touch devices are running an iOS 8.4 / iOS 8.3 / iOS 8.2 / iOS 8.1.3 / iOS 8.1.2 / iOS 8.1.1 / iOS 8.1 / iOS 8.0.2 / iOS 8.0.1 / iOS 8.0 Firmware and you're using a desktop PC or laptop powered by Windows or Mac OS X operating systems, then you can install newly introduced iOS 8 Jailbreak Tool developed by new Chinese iOS developer's team named "25PP". PP Jailbreak Tool also supports Cydia Substrate and Cydia Mobile Substrate installation and works in a similar manner like the other iOS Jailbreak Tools i.e. TaiG, PanGu, Evasi0n etc. According to iOS-Jailbreak community, PP Jailbreak uses the same exploits from TaiG Jailbreak, and no new exploits were burned. We are providing working guide and tutorial on How to Untethered Jailbreak iOS 8.4 Using PP Jailbreak Tool On iPhone 6 Plus, iPhone 6, iPhone 5S, iPhone 5C, iPhone 5, iPhone 4S, iPod 6G Touch, iPod 5G Touch, iPad Air 2 6G, iPad Air 5G, iPad 4G, iPad 3G, iPad 2G, iPad Mini 3, iPad Mini 2 and iPad Mini devices. Backup your iOS device using iTunes or iCloud. Disable Find My iPhone, Passcode, Touch ID, and Enable AirPlane mode. 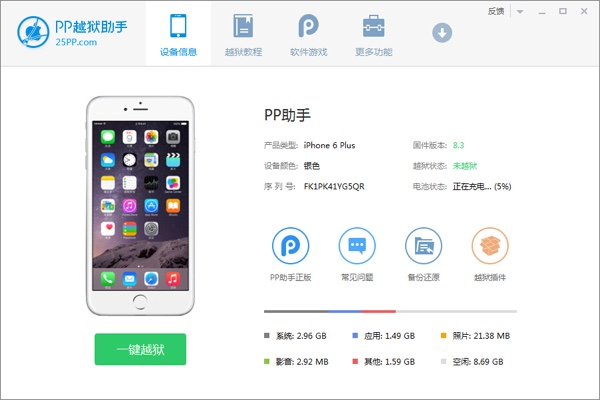 How to Jailbreak iOS 8.4 Using PP Jailbreak on Windows? Step 1: First, Connect your iPhone, iPad or iPod device directly to your Windows or Mac PCs / Laptops via USB data cable. Step 2: Download and install PP Jailbreak Tool or PP Assistant .exe file, and run it on your system. Step 3: Now, remain the first PP box checked and press the Blue Button. Step 4: On the main PP tool, Press the Green Button to start iOS Jailbreak. Now on the second screen click the 2nd Button to confirm Find My iPhone disability. Your iOS Jailbreak will starts. Step 5: Now, just relax and wait for few minutes, until your iPhone, iPad or iPod boots to the Lock screen, after you get complete message on the PP tool. Step 6: After the whole Jailbreak process completes, your iOS device will reboots and you should see Cydia installed on your iPhone, iPad and iPod Touch device, Open Cydia to finish the setup. Congratulations!! You're done. How to Jailbreak iOS 8.4 with PP Jailbreak on Mac OS X? Step 1: Download and install PP Jailbreak .dmg file through above mentioned links. Step 2: Connect your iOS firmware running Apple iDevice to your Mac OS X. Step 3: Turn off all pass codes, Find My iPhone, and activate Airplane mode. Step 4: Start PP jailbreak tool and ensure your device is connected. Step 5: Unchecked Install PP helper option box. Step 6: Now, Press the big Jailbreak button, after careful reading of all instructions, click Continue button. Step 7: Wait, and let the whole jailbreak process gets completed. Step 8: After completion of whole process and additional iOS setup processes, go to your device home screen and click on Cydia application. Congratulations!! You're done.